The Automata Blog: littleBits electronics kits -- an opensource library of electronic modules that snap together magnets! littleBits electronics kits -- an opensource library of electronic modules that snap together magnets! Amazon has been creating lists of recommended toys for the holidays for years. I just discovered that they now have a specific STEM Holiday Toy Guide -- that's Science, Technology, Engineering, and Math. This list is big! 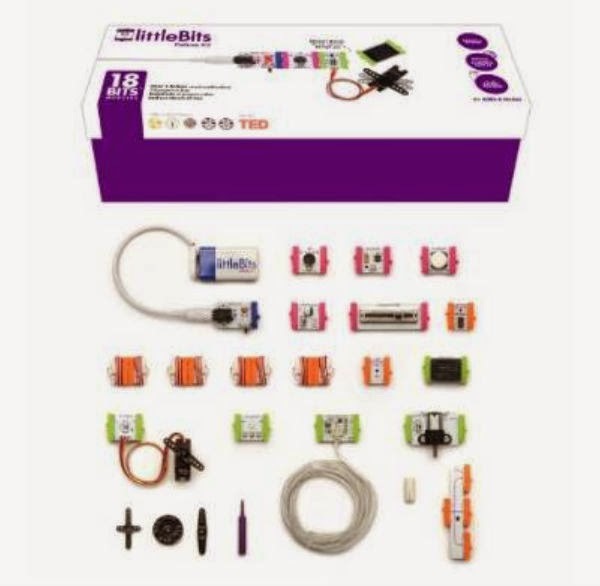 Shown above is the littleBits Electronics Deluxe Kit. This is the biggest of the littleBits electronics kits -- an opensource library of electronic modules that snap together with tiny magnets for prototyping. No soldering required. Now that's a great idea! This particular kit features 18 modules. You will have everything you need to make something that blinks, moves, makes noise, and more! these are really clever kits and the have many different ones. While this kit is the biggest, they offer many more exciting and educational kits. They are something like the SnapCircuit kits which have been available for a while, which also don't require any soldering. Check out the full full line littlebits and SnapCircuits kits. You can have completed electronic circuits humming away on the kitchen table before the plates have been cleared!